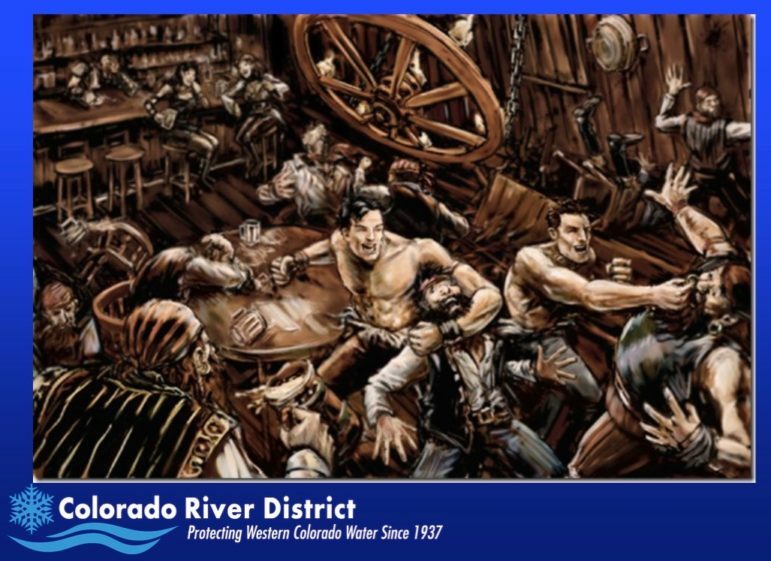 A slide presented by Andy Mueller, general manager of the Colorado River District, on Sept. 14, 2018 at the district's seminar called 'Risky business on the Colorado River.' 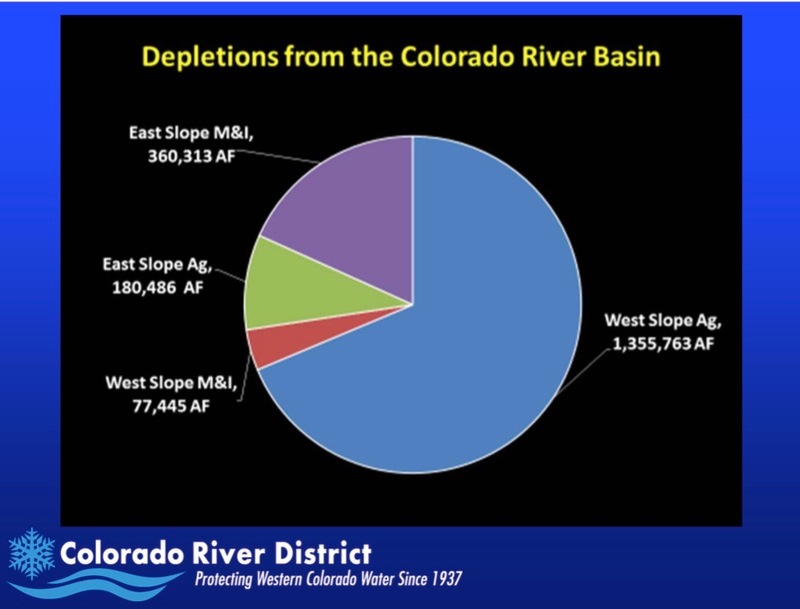 The slide shows how water from the Colorado River system, within the state of Colorado, is used. (Also see, “River planning muddied up?” by Dennis Webb in Grand Junction Sentinel on Sept. 14). 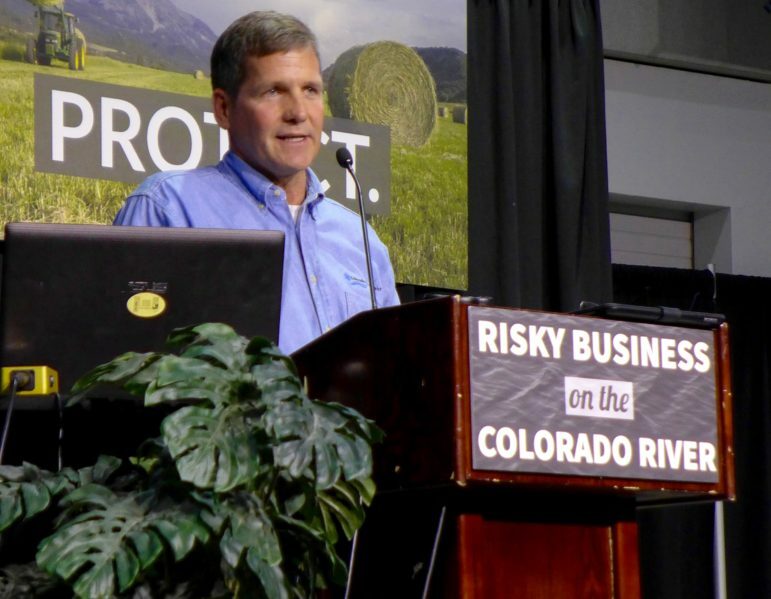 Andy Mueller, the general manager of the Colorado River District, addressing a crowd of 265 water managers, users and stakeholders in Grand Junction on Friday at a River District seminar called 'Risky business on the Colorado River.' Mueller spelled out six principles the River District wants the state to embrace as it develops a 'demand management' program designed to get the state's water users to reduce their water use in order to bolster levels in Lake Powell. One of the slides in Andy Mueller's presentation deck on 9.14.18. On Tuesday, the River District also released a series of letters and a draft resolution on the issue, including a letter from the River District and the Southwestern Water Conservation District to the CWCB board, a draft resolution from the River District and Southwestern they want the CWCB to approve, a letter from the Colorado Basin Roundtable to the CWCB, and a letter from the Front Range Water Council to the CWCB. The letter from the Front Range Water Council, an ad hoc collection of the largest water providers on the Front Range, was dated Sept. 13. It includes a reference to the possibility of a non-voluntary water curtailment program in the upper Colorado River basin states of Colorado, Utah and Wyoming. In its letter to the CWCB, the Colorado River District and the Southwestern River District, stressed the need for consensus, and their inclusion, on any sort of mandatory curtailment program. Editor’s note: Aspen Journalism is collaborating with The Aspen Times, the Glenwood Springs Post Independent, the Vail Daily and other Swift Communications outlets on the coverage of rivers and water.